Ed Brubaker's got a way with words. Well, that is, as far as Catwoman: The Dark End of the Street is concerned. Brubaker's always been kind of a cypher for me -- the half of Gotham Central that I don't know from Batman or anywhere else (I have heard that his Sleeper is good, and I know I ought to read it). 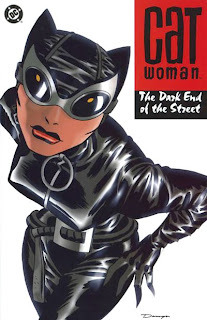 But Catwoman: The Dark End of the Street could be a close-to-flawless trade paperback -- nary a false note to be found. Excellent dialogue: a Batman who doesn't say a word more than he has to, and Selina, with all her charm springing from how tentative Brubaker writes her, afraid to even ask Oracle for information for fear of rejection. Great art, too -- Darwyn Cooke and Mike Allred's cartoony style works well with Catwoman's athletic prowess, and I think it adds something just plain creepy to the darker aspects of this story. I know the stories will get even darker as I read toward Relentless, and I'll be curious to see how the art holds up. If anything didn't sit well with me, it was Catwoman triumphing over the bad guy due to just plain luck. I mean, she found out what bar the killer went to, and learned that he had a face like a famous actor, but in the end, it was an offhand comment in the right place, at the right time, that got her the gold. Coincidences in life are one thing, but when you have a coincidence in a story, it feels to me like that's the writer's hand, waving right at you. So I had to blink there, but it's a minor point; I'll have to see if it remains the case in the other books. Oh, and favorite line? Holly going, "For the past few years, we thought you were dead." Just goes to show, there is a train that drives out of limbo every once in a while. And hey, does anyone know the pre-Crisis (or is it pre-Zero Hour?) issue where Holly died? I can't find it. And was Selina's sister Maggie supposedly dead, pre-Zero Hour, too?